Everyone in the playground knows the enormously fat kid can’t run fast. It’s just obvious. In that same vein, everyone in the life sciences community intuitively understands Big Pharma struggles and fails to create truly innovative new types of drugs. It’s just not part of their DNA. 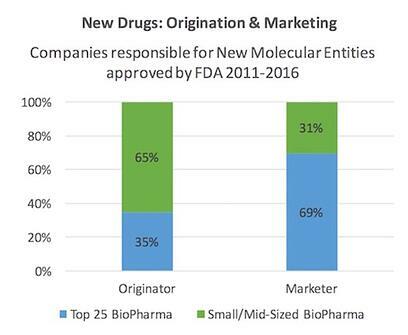 “Small and medium-sized companies generate greater than two-thirds of the clinical candidates in the pharma and biotech industry drug pipeline,” is one of many declarations on the state of the industry. Here is the same type of recent finding in chart form. Whether this needs addressing is a difference of perspective. Having helped BCC Research custom consult for a top 20 pharma company, we demonstrated clear advantages of segmenting their internal drug discovery and also external compound acquisition programs. Each was broken into smaller units with direct ROI feedback loops. Size matters inversely proportionate to innovation. 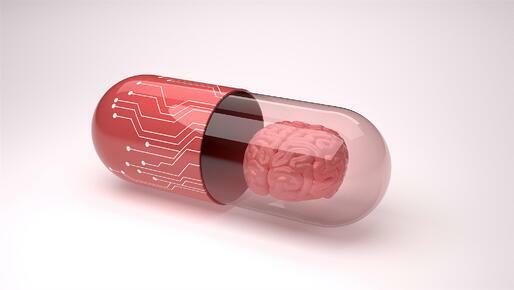 Twenty years ago in life sciences, most of us understood personalized medicine was coming—and also that Big Pharma was heading toward the streamlined structure of an in licensing office, with a sales and marketing division grafted onto it. It now seems obvious we’ve arrived at the threshold of both understandings coming true. Along those 20 years, many have written about the writing on the wall—I especially like Luke Timmermans article from 2012—its incisive and clear, and the comments below are absolutely wonderful. 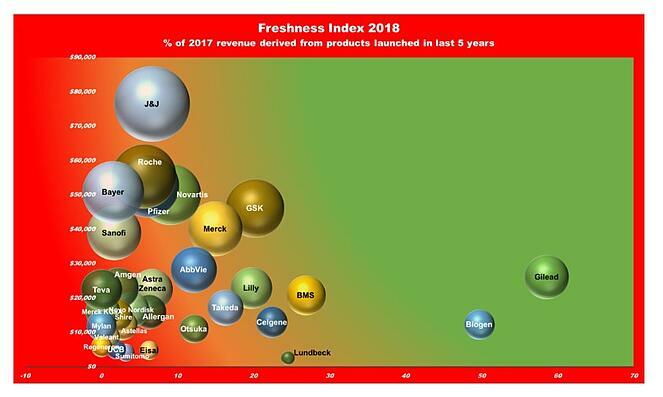 This is in contrast to the last 20 years for software companies, which is drawn more clearly further below. We need more medium-sized pharmaceutical companies to provide moonshot type therapies. Unfortunately, structural and financial levers reflexively precipitate mergers and acquisitions instead. The result is a landscape of high profits, happy investors, fewer brilliant drugs and higher healthcare costs. To get to a point where more small and medium companies provide highly innovative drugs, the business incentives and regulations need to approach socialist or perhaps communist levels. Policies that have been put into place until now, such as tax relief, research incentives and investment stimuli, have not risen to the required level of warning off the Circean mating trumpet calls from the elephants in the room. The EU has consistently bolstered regulations, but closing the stable door with Big Pharma companies inside, seems an exercise in conscience easement only. One measure of innovation is perhaps how much revenue flows from the newest products. The chart below shows only 11% of income is derives from the last 5 years of results. Clifton Leah in Fortune gave this a punchy article title “How Stale Is Innovation in Drug Discovery? Think: 5-Year-Old Yogurt,” and while it suits my argument to shudder at old yogurt, current pharma product analysis is really an exercise in business archeology because the development and approval process takes so long, and masks the novelty imbedded in something just released, but that took a 15-year journey to get there. However, out-of-pocket R&D costs of an approved drug do not vary greatly between small biotech and large pharmaceutical companies, but those originated by small biotech ﬁrms take about 7.5 months longer to reach FDA approval, increasing their capitalized cost (DiMasi and Grabowski, 2007 ). Our business landscape is heavily tilted in favor of the biggest companies, and yet to my mind, they are the least deserving of favors. The following explains why we should increase the headcount of small and medium sized enterprises. 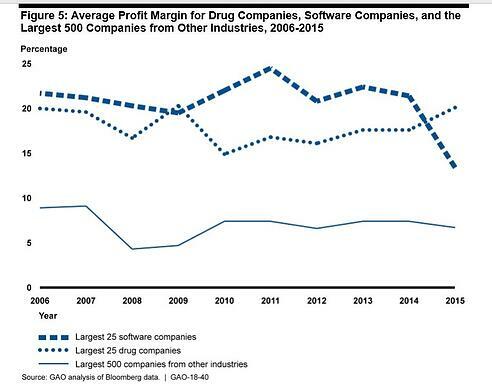 Profits are healthy, but our newest drugs are infirm, sickly or out of date. Profits are perversely high, given the lack of truly imaginative novel therapies becoming ICD10 Codes. I am not even raising the problem that ours is still a disease care system, and not a healthcare system. But that’s another blog post. I will also not touch the topic of antibiotics, a uniquely communal resource, which requires its own specialized fix. But I will emphasize that profits of this eye-popping magnitude should mirror amazingly beneficial new and cost-effective treatments. And they just plain don’t. In fact, to further my odious comparison with software by looking down, it seems, the wrong end of a telescope, a deliciously pejorative law has been coined to point out how truly awful Big pharma’s performance has become—it’s called Eroom's law, which is literally (for the more literate among you, verbatim et literatim) Moore’s law in reverse. If you work in the pharma industry and want to be stunned at how bad things now are, stare straight into the gorgon face of the Eroom chart below: It made me truly thankful my recent startup activity is in software. 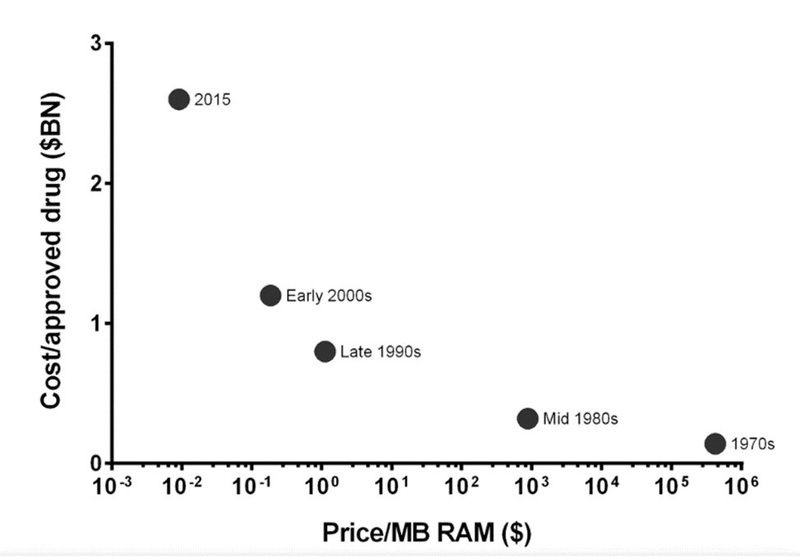 Drug discovery is becoming slower and more expensive over time, despite improvements in technology. The cost of developing a new drug skyrockets rather than falls. In order to highlight the contrast with the exponential advancements of other forms of technology (such as transistors) over time, the law was deliberately spelled as Moore's law spelled backwards. Originally here but in brief here. In part two of this blog, I continue to argue that smaller more focused units outside of big pharma is the solution. Perhaps not enough to reverse the trendline, but it will move the needle sufficiently to be worth the effort. However, things are getting worse not better.